San Francisco, CA - January 20, 2018: Unidentified participants in the Women's March. Designed to engage and empower all people to support women's rights, and to encourage vote in midterm elections. What if they held an election and everybody came…but it didn’t make any difference, anyway? OK, maybe not “nothing.” But not very much. Nate Silver at FiveThirtyEight gives Democrats an 86 percent chance go taking the House but just an 18 percent shot at control of the Senate. According to Democratic political strategist Bob Shrum, now director of the Center for the Political Future at the University of Southern California, their latest polling finds a Democratic advantage of around 17 percent in voter preference. But because those liberal voters tend to be packed together around major urban centers, the net number of Congressional seats they pick up may not be as impressive as their poll numbers. Net result: A narrow Democratic House majority. Hardly the political earthquakes of 1994 or 2010. Not everyone agrees. Shrum believes a 30 or 40 seat Democratic House wave is on its way. And if Shrum is right….so what? On Wednesday, November 7th, the House is controlled by Democrats, the Senate is slightly more Republican, Trump is still Trump, and America is just as partisan and divided as it was before. We remain the fairly evenly split, 50-50 nation we’ve been since at least the 2000 Bush v. Gore election. 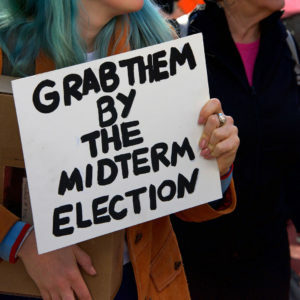 Which is why this may be a ‘MacBeth Midterm:’ Rather than a major shift in political direction, a clear win for one party or the other that resolves the national debate and sets our politics on a new course (think Reagan in ’80 or Kennedy in ’60), this election is instead going to involve massive turnout and record-setting levels of campaign spending and shouting mobs and protests and politicians chased out of restaurants all leading up to….more of the same. Consider the Clinton example. When his party lost control of Congress, President Clinton abandoned his leftward push and famously declared “The era of big government is over.” The Clinton presidency after the GOP took control of Congress was very different from the first two years. Does anyone expect a similar shift in the Trump presidency? The more likely outcome is for Trump to double-down on his “us-vs-them” warfare, but with the added benefit of Speaker Pelosi as his new foil. “Trump is going to have to show he can make deals with the Democrats,” Shrum says, and Democrats are going to be ready to deal. “I think they’re also going to attempt to do a real middle-class tax cut, probably paid for by rolling back some of the tax benefits that went to the top one percent,” and he sees an infrastructure package potentially on the table, too. That’s one scenario. The other is that the newly-energized progressives like Rep. Alexandria Ocasio-Cortez and Rep Ayanna Pressley show up in Congress ready to wage war against a president they’ve preached is both prejudiced and impeachable. Meanwhile, would-be presidential candidates in the U.S. Senate like Cory Booker, Kirsten Gillibrand and Kamala Harris will play to their party’s progressive base in an attempt to power up their 2020 campaigns. All of which will give President Trump precisely the political opponent he wants for his re-election campaign. The first scenario is based on hope. The latter is based on experience. Place your bets accordingly.